Roasting Brussels sprouts in your oven is one sure way to get family members to eat their vegetables. I was surprised how fast these Brussels sprouts disappeared from the table the first time I prepared them this way. I continue to be surprised when family and friends ask me to make them for our gatherings. 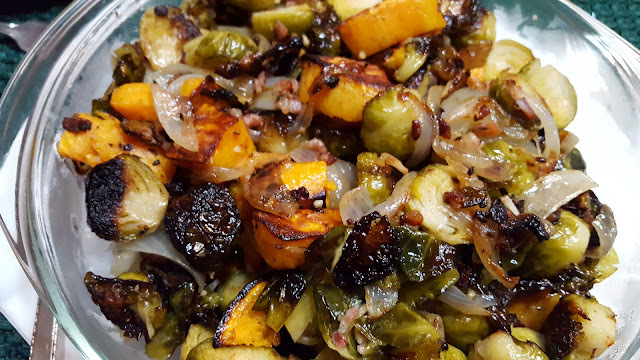 This is my tried and true recipe for oven-roasted Brussels sprouts. Make them for weeknight dinners and special occasion meals. They are a delicious side dish for any occasion. One of the keys to super flavorful roasted Brussels Sprouts is preparing them in advance. This will allow time for the flavor of the onions, garlic, and bacon to blend throughout. I like to mix all the ingredients together at least an hour in advance but even the day before will work. Use frozen bacon for this dish. It is so much easier to cut the bacon into little bits when it is frozen. You'll want the pieces of bacon to be very small because they will distribute well throughout the dish and crisp nicely as it roasts. I am specific about the way I cut my onion, too. I think it makes a difference to the end result. Cut the top and bottom off your peeled onion. Cut the onion in half from top to bottom and then cut each half into thin wedges. This allows the onion to caramelize and not burn at the oven high temperature. High oven temperatures always produce the best results for me. I've tried lower temperatures when trying to cook my Brussels sprouts along with my meat entree, but the Brussels sprouts don't have as much flavor as when roasted at 400 or 425 degrees F.
Finally, and perhaps my most important tip, is spreading the ingredients out in your pan. Do not crowd the ingredients. A low sided sheet pan works best because you'll have plenty of room for the ingredients and the low sides allow the heat to circulate well. One sheet pan will work for four to five servings. Use two sheet pans for six to ten servings. Since I've been making my Brussels sprouts this way they have become a frequently requested side dish for all of our family dinners. Try adding cut up potatoes or sweet potatoes for a twist. Oh, so good! Cut the bottoms off your Brussels sprouts and slice them in half. Place the Brussels sprouts in a single layer in a baking pan. Finely chop the cloves of garlic, and slice the onion into wedges. Dice the bacon (freezing the bacon first makes this easy). Add the garlic, onion, and bacon to the pan with the Brussels sprouts. Mix well to distribute the ingredients. Drizzle with olive oil and season generously with salt and pepper. Mix again to ensure the olive oil and seasonings are well distributed. Cover and set aside for at least one hour. Spread the ingredients on a sheet pan being careful not to crowd. 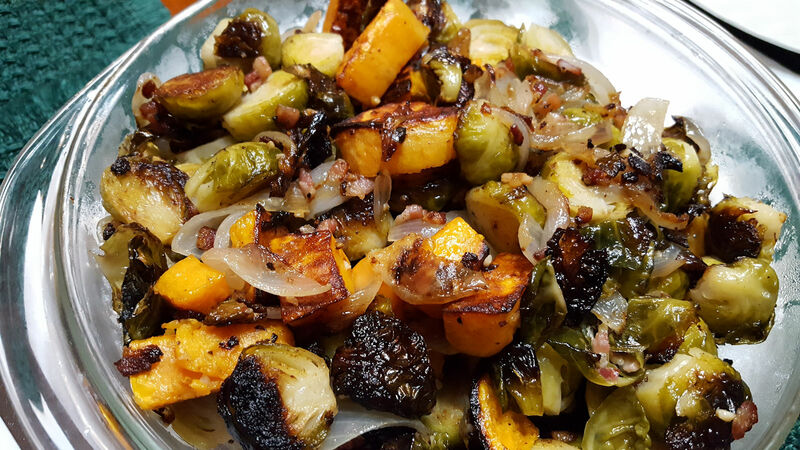 Roast the vegetables in a preheated 400-degree F oven for 30-40 minutes, until Brussels sprouts are well-browned and the bacon is crisp.﻿ Periodically give the Brussels sprouts a stir while they are cooking. Don't rush the cooking process. 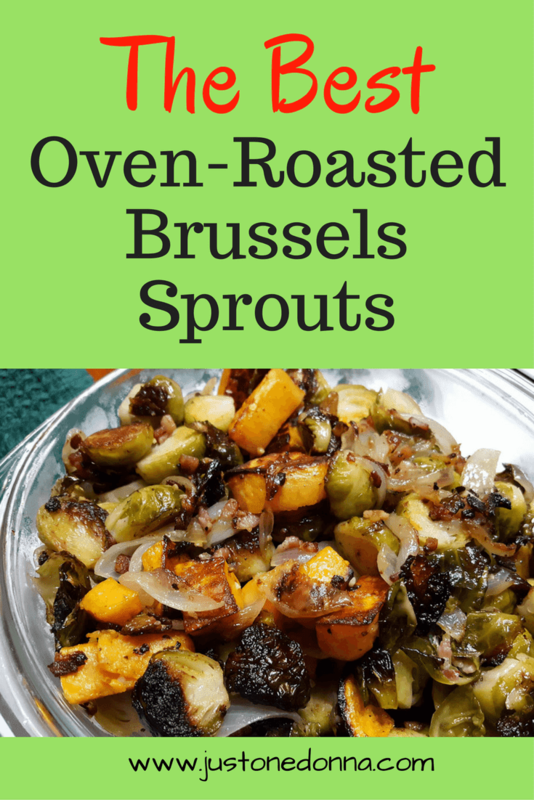 You want your Brussels sprouts to get really brown and crispy on the edges. That caramelization creates great flavor. Here they are in all their roasted yumminess. Brussels sprouts deliciousness...You're welcome. I'm telling you, friends, make these Brussels sprouts and you'll be thanking me! I love the addition of the sweet potato. Pinning this! Thanks, Missy. The the color and sweetness of the sweet potato works really well. Sometimes I'll toss the sweet potato in a little of my Southwest spice mix for a little added flavor. So yummy!